The article of EtQ named Quality Management Software Solutions for Automotives said that automotives in contrast to other types of vehicles is the most popular and convenient vehicle for transportation of goods and passengers over relatively short distances. It has greater maneuverability, good adaptability and terrain in different climatic and other conditions. However, this article states that one of the major problems facing the automotives is environmental problem. In calm weather and low atmospheric pressure on busy motorways oxygen content in the air is often reduced to a value close to the critical value at which people start to choke, swoon. They are affected not only the lack of oxygen, but also harmful substances car exhaust. This is especially dangerous for children and people with poor health. The article offers one of the ways reduce harmful automobile emissions – use of new transportation fuels. The article How the Automotive Industry Benefits from Customer Feedback and Data Management Solutions by InsiteSystems points on the importance of customers’ feedback. First, it is certainly a way for the head to track the performance of managers, operators, delivery and take the necessary measures to improve the work and improve the quality of service. Secondly, a new way to attract customers, not by price, not by bonuses, no by gifts, no by discounts, but by service. The article points on radically change of the position in the ranking of automakers and then increase of the number of loyal customers in the case of the positive feedback. 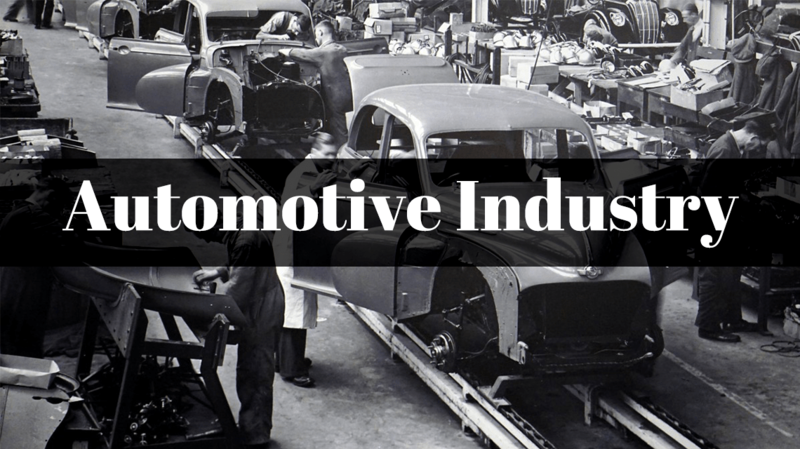 The article Global Automotive Industry by ReportLinker claims that automotive industry today is one of the leading engineering industries. It significantly affects the development of not only the economy as a whole, but also on the pace and direction of scientific and technological progress in the sectors of the economy in some way connected with machinery construction. The article points out that meaning of the automotive industry cannot be overemphasized. It, being not only a major consumer of labor, material and financial resources, but also one of the main manufacturers of industrial products, plays an important role in the development of social production, the global economy and individual countries in particular. Also, article proposes certain solutions of environmental problem. The article Productive Agglomerations of Suppliers in the Automotive Industry: a Way to Maximize Competitiveness in Supply Chain Management points out that increased competition is forcing manufacturers to quickly and accurately respond to individual customer needs, as long as possible to maintain the commitment of customer to chosen brand. The article claims that in order to accurately respond to regional and individual requirements, there are required optimum highly organized system OEMs, systems and components suppliers, partners, and, of course, customers. It also proposes the ways to maximize the competitiveness in supply chain management. The research Mves: A Mobile Vehicle Expert System for the Automobile Industry offers a solution of sparkling in a vehicle, concluding that the higher is the voltage, the less ignition system is sensitive to contamination of spark plugs and composition of the mixture. The research also allocates the most common reasons that lead to the engine overheating and recommends the ways of prophylaxis and what cannot be done in the case of the boiled engine. The article Managing the Automotive Marketing and Sales Cycle through Mail propose solutions for effective managing of marketing policy and information-analytical and statistical data on the operation of automotive enterprises of USA and the rest of the world in dynamics for the current period of 2013 and in comparison with the corresponding period of the previous year.